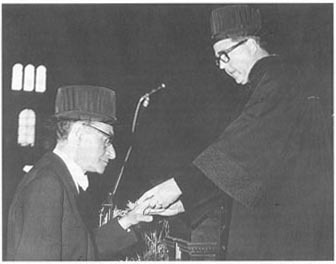 Paul Kallós, founder of the CIA, receiving his M.D. Paul Kallós was born in 1902 in Budapest, completed his medical studies at the Royal Elisabeth- University in Pecs in Hungary and started his research in immunology in the difficult times under the threat of persecution. He emigrated from Hungary to Germany - Leipzig, Nürnberg - where he married Lieselotte Deffner. In 1932 they moved to Switzerland and finally 1934 to Sweden where he started working in the laboratory of the academic hospital in Uppsala. In 1937 Kallós moved to the Wenner-Gren Institute in Stockholm. Since 1944 Paul and Liselotte Kallós resided in Helsingborg doing medical practice in allergology and research in their own Wihlborg-Laboratory. Kallós managed in an exemplary fashion - under most difficult circumstances - to combine excellence in basic science with practical medicine. In the beginning, his interests focused on the phenomena of immunity and allergy during infection with M.tuberculosis. In this early work Kallós stressed the role and functional activity of the macrophage system with regard to the susceptibility in the clinical course of an infection. His second area of interest was the experimental study of bronchial asthma using the sensitized guinea Pig model. Kallós described morphological and functional differences between allergen-specific and pharmacologically induced bronchial constriction and developed methods using aerosol techniques for bronchial provocation under standardized conditions in the animal experiment. In these studies he could show that the contraction of the uterus of sensitized guinea pigs after allergen stimulation was independent of the molecular weight of the allergen. He concluded that the allergen-antibody reaction has to take place on the cell surface and is independent on diffusion mechanisms. The third major focus of interest of Paul Kallós is the work on non-immunologically mediated adverse reactions to drugs, mainly aspirin idiosyncrasy. Paul Kallós was in the forefront of developing the concept of pseudo-allergic reactions (together with G. West, H.D. Schlumberger and P. Dukor). Parallel to his own scientific work, the lifetime achievement of Paul Kallós in his editorial work has to be stressed. As editor and cofounder of the "International Archives of Allergy and applied Immunology" and of the monograph series "Progress in Allergy" and "Monograph in Allergy" he was both "catalyst and mediator of scientific concepts" (P. Dukor). In 1954, it was Paul Kallós who was most intensively involved in the foundation of the Collegium Internationale Allergologicum a community which he guided and shaped as first honorary secretary, later as honorary member. The contributions of Paul Kallós have been recognized by numerous societies and medical communities: Honorable medical degrees of the universities of Göteborg and Lund, honorary professorship in medicine, Pirquet gold medal, Robert-Koch-Medal, Karl-Hansen-Medal (German Society of Allergy and Clinical Immunology), just to name a few. His private and scientific life was inseparably connected with his wife Lieselotte Deffner, who also was founding member of the CIA. The Collegium Internationale Allergologicum honoured Paul Kallós by a special symposium in 1986 on the occasion of the symposium in Göteborg (laudatio by Peter Dukor) and later on by the introduction of the "Paul-Kallós-Memorial lecture" taking place every two years at the CIA symposium.